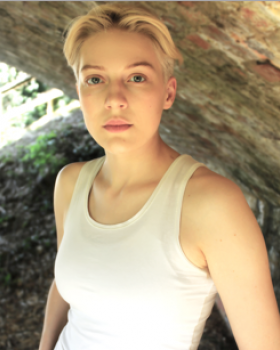 Tilda Wickham is a non-binary actor, artist and singer. They recently appeared as Jo in Brood (by Rosanna Suppa and Robbir Taylor-Hunt), a new web series about queer people deciding to have babies. Whilst at Cambridge University, Tilda played Juliet in Shakespeare's Romeo & Juliet directed by Tom Littler, at The Cambridge Arts Theatre, and Anna of Cleves in the original cast of SIX The Musical in its sold-out run at the Edinburgh Fringe Festival in 2017. Tilda also co-wrote (co. Robbie Taylor-Hunt) and performed in A Queer Anthology of Dating at Southwark Playhouse, as part of the Anon Is A Woman festival of new writing. Tilda continues to write plays, make artwork and sing with their band.